Fishing conditions have been fantastic over the weekend with clear sunny periods and very little wind allowing the Tongariro to really show what it is holding in it’s waters. Dry fly fishing was pretty good with most fish willing to come up to fairly good sized rubbery leg thingys. I have caught most of my fish over the past few days by walking very slowly and polaroiding the shallow fast water which is full of oxygen at the moment. 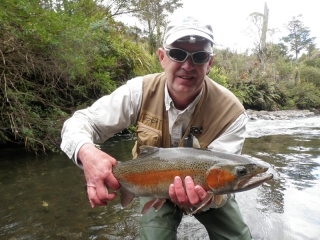 The majority of trout are above average in size and condition most of the rainbows are looking fat and healthy with only the odd spent fish still in the system. 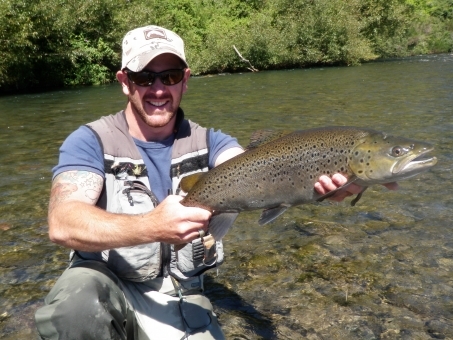 Angling pressureÂ is again low and is a perfect time to find river to yourself. The browns have made their way into the river and are in good numbers which are very catchable if you are in the right place and using the right method. Everyday someone is catching a big brown or atleast hooking into one of these monsters, hooking is one thing but landing is another. There are a large proportion of fisherman especially from Aus which seem to think that the browns don’t fight as hard as the fiesty rainbow!! All I can say is that when you have one of these fish which weighs 7lb or more and it gets into fast or deep water you are a very good angler to get it to the bank,these fish know they are doing when hooked and most occasions will end in tears. I agree that quite often the backcountry or Aussie brown does not give up as much fight but our Tongarrio brown is a totally different fight than any other trout and can not be compared. I managed to get out twice by myself last week after posting the last blog and promised you that if I caught one I would update straight away and show you the pic of my monster. Well on the first outing that did not happen but I did loose a very good fish down the rapids in an upper river pool but while out on the second outing I finally managed to get one to the bank. This fish I spotted in shallow water no deeper than 10 inches and after a few casts with different weighted nymphs he turned and displayed the white of his mouth which was enough indication to me to set the hook. I must have spotted 10 browns while out for 4 hours but this was the only one that was not spooked by the cast or wanted the fly. I think I had about 5 rainbows from different pools using traditional nymphing methods ad the deadly quasimodo fly. Just a short report today guys, have a great few days at work or on the river and will catch,ya again at the end of the week.